“STEP USA” delegates from the German American Chamber of Commerce met with FeldbergPacific. 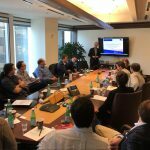 FeldbergPacific hosted the German American Chamber of Commerce’s Delegation, “STEP USA” at its San Francisco office to kick off the group’s 5-day bootcamp for German startups. Achim Hoelzle presented the entrepreneurs with the knowledge they need for successful legal structuring for VC transactions.